A while ago, I saw that Miximal, a variation of the flip-book game we used to play as kids, was free for a time. So I downloaded it to see if it was something I could recommend here at The Book Chook. It is! While I advocate that young kids not spend too much screen-related time, Miximal is one of those apps that’s perfect for when your preschooler or Kinderkid wants a “turn” on the iPad. Basically, it’s a digital toy. The screen is divided into three and children can swap heads, upper bodies and lower bodies with a simple swipe. Each part comes with a little animation that’s fun to watch and hear. Once a child is happy with the visual combination, he can press play to see the resulting animal name in chunks. So, if he chose an elephant head, a chimpanzee upper body and a flamingo lower body, he would see and hear “e-pan-go”. Isn’t that a nice way to incorporate word play into the fun? What I liked: I love to find apps that support early literacy. With so many garish apps out there, I find myself constantly drawn to apps that have beautiful, gentle art work, like Miximal. Our children deserve to interact with excellent graphic design. I also liked that the app is intuitive, works well and easily from the start, and has lots of combinations available. 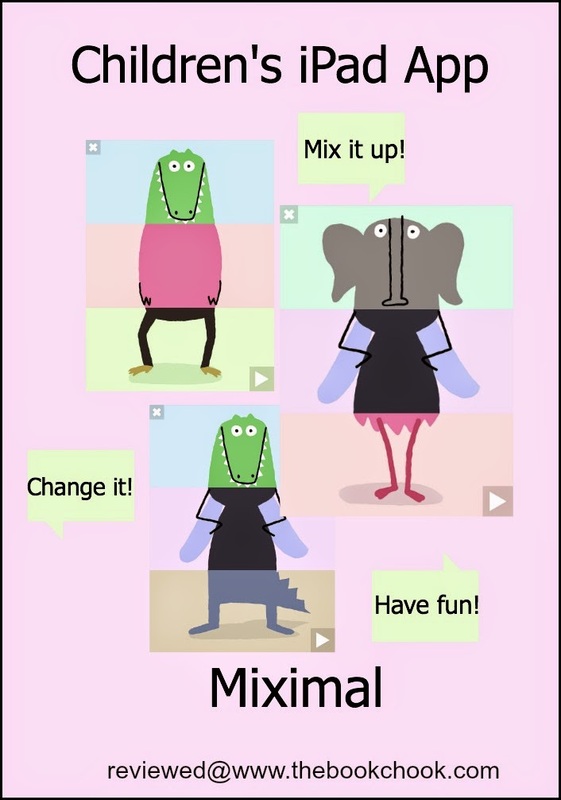 Follow-up: Miximal would be a fun activity to follow up as a family or class group. Older siblings will enjoy designing head and body combinations, and younger siblings will enjoy mixing! Add an element of chance to the game by asking children to choose parts with their eyes closed! Another literacy-based idea is to have children experiment with breaking animal words into syllables - el-e-phant, ti-ger - and then create new animals from mixing syllables - eleger. Keep it simple for younger kids by only mixing heads and bodies, and dividing animals and animal words into two. Issue older primary/elementary children with a challenge: what would a Tyrannophantazee look like? What sort of habitat would you expect it to live in? What would it eat? Describe its predators. Always appreciate such great feedback, Kylie M!